When surfing the web on your iPhone’s Safari browser, it is common to find websites that offer content in PDF format. The Safari browser for iOS can open PDF documents but what if you need to download and save the PDF documents to read later? Downloading PDF documents on your iOS device allows you to access them without needing to connect to the internet every time you need to read the PDF. In this article, we will take a look at some top ways you can have a try to save PDFs from Safari on your iPhone. Where The Downloaded PDF Files Are Saved on iPhone? Before we begin downloading PDFs on your iPhone, it is important to outline where the PDFs are saved on your iPhone. Most people are confused about it, so before we download any, let’s share with you where they go. PDFs that are downloaded from the browser go to iBooks and can be read there. If you however choose to download PDFs to the iCloud drive or other PDF readers, the downloaded documents will be saved to iCloud Drive or the PDF reader of your choice. If you don’t have a PDF reader, the PDF document will still be saved on the iPhone and you’ll be able to open them once you’ve downloaded a suitable PDF reader. Step 1: Open Safari on your iPhone and then locate the PDF you want to download. Step 2: Tap on the PDF and then tap on “Open in iBooks” option. This will download the PDF to iBooks on your iPhone. Alternatively, tap on “Open in…” and then choose to save the PDF in iCloud Drive or other PDF readers you have on your device. You may also want to download a regular webpage in Safari as a PDF document for later reference. This is a great way to save webpages with important information that you don’t want to lose such as a list of instructions, a recipe, an online guide or any other type of data that you want to refer to later. 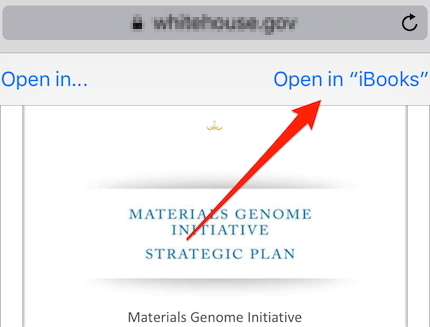 Step 1: Open the webpage with the information you need in Safari and then click on the “Share” button at the bottom of the page. Step 2: Scroll right to reveal more options and select “Create New PDF”. This will automatically convert the page to PDF. 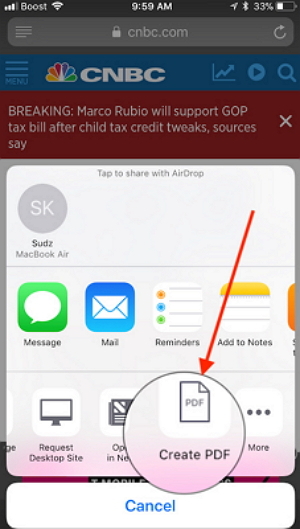 You can then use the “Share” option again to move the newly created PDF to the Files app and open it with your PDF readers later. Saving PDFs in safari is a great way to manage your files, but there are certain things we think you should be aware of if the process is going to run smoothly. To begin with, if you are using iCloud Drive to store the PDFs on your iPhone, please note that you can see the PDF document almost immediately in iCloud Drive. But it may take some time for the document to show up in the folder depending on the speed of your Wi-Fi or the size of the document. If you would like to save the PDF into an iCloud folder via the Files App, please note that the option will only be available if you have enabled iCloud Drive in Settings. If you can’t find the iCloud Drive in the Files app, go to Settings > Your Apple ID Profile > iCloud and scroll down to enable “iCloud Drive”. 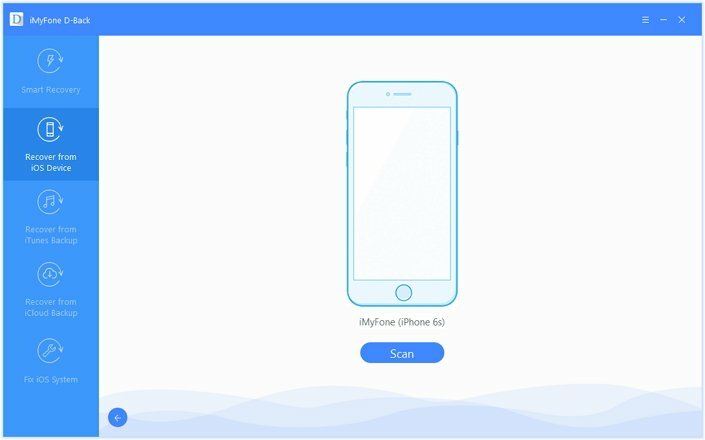 iPhone data or files you have saved are very susceptible to data loss. Unexpected things may happen due to a lot of reasons like accidental deletion and etc. In this case, there are certain things you can do to minimize the damage and prepare for data recovery. The first thing you should do is to stop using the device immediately. This will prevent the lost data from being overwritten. 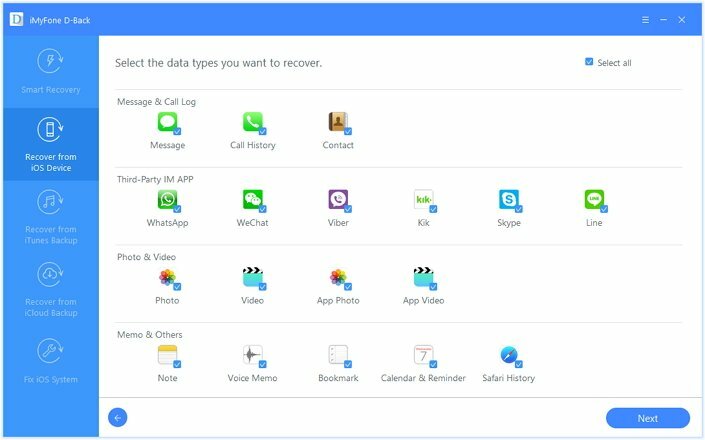 It can be used to recover more than 18 different types of data including messages, photos, videos and even third-party data like WhatsApp, WeChat, Viber. It is fast and effective. You’ll have your recovered files in just a few minutes. It can also be used to extract data from and iTunes or iCloud backup file which is ideal when don’t want to restore the full backup just to get back a few messages. Step 1: Begin by installing the program to your computer and then launch it. From the main window, select “Recover from iOS Device” and then click “Start” to begin. Select the type of data you’d like to recover in the next window as the type of data to recover and then click “Next”. Step 2: Connect the iPhone to the computer using USB cables and wait for the program to detect the device. Click “Scan”. Step 3: When the scanning process is complete, you should see a list of all the data on that device displayed in the next window. Select the data you want to recover and then click “Recover” to save them to your computer. Although D-Back doesn’t yet support PDF files, it supports a whole host of other types of data including Safari bookmarks, notes, messages, contacts, photos, videos, etc. 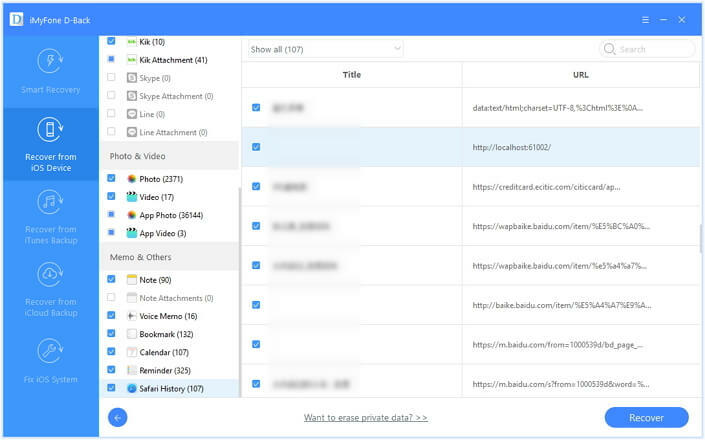 The free trial version may give you an idea whether the data can be recovered using this tool. Download it for free today and experience the power of data recovery like never before.